Longer exposures cause the stars to "trail"
Equatorial Mounts: When astro-photographers take time exposures of just the stars, they use an equatorial mount and a tracking mechanism that keeps the stars in sync with the earth's rotation. 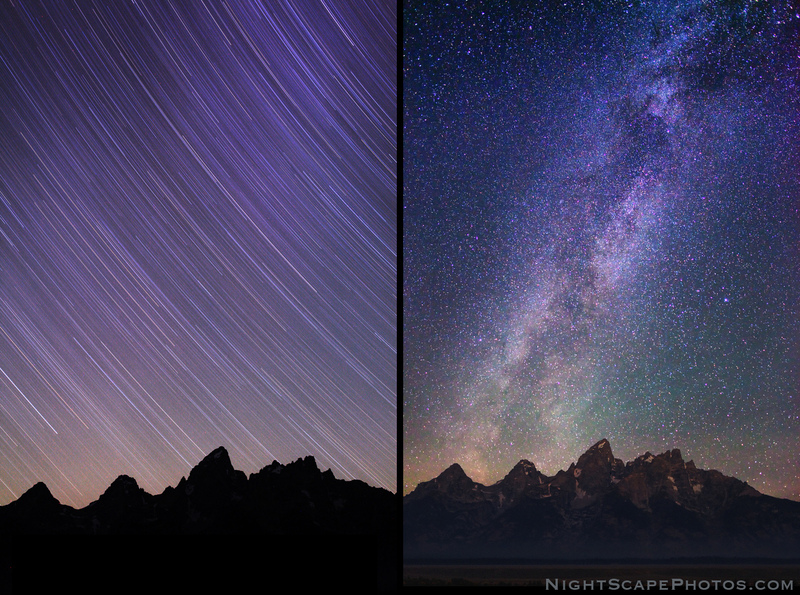 Using this system, exposures can be extremely long without blurring the stars or causing them to "trail". If any of the earth's landscape is included in the photo, it is the landscape that would now become blurred during the exposure. 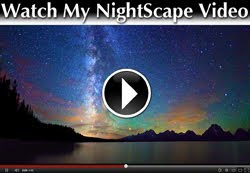 Sharp stars AND landscapes: Because astro-landscape or "NightScape" photos require both the stars and the earth to remain sharp during the time exposure, the length of the exposure must be short enough so that the stars do not appear to rotate or trail due to the earth's rotation. The math to make it happen: Astronomers know that a normal lens views a smaller area of the sky than a wide angle lens, and a telephoto lens views an even smaller area of the sky. The narrower the field of view, the shorter time it takes for the stars to trail across the camera's picture area. For this reason, lenses with a longer focal length (more telephoto) will have faster star movement or trailing than lenses with a shorter focal length (more wide angle). Using simple math, amateur astronomers developed a formula called the "600" rule to determine the maximum exposure times for various lenses mounted to 35mm film cameras. The 600 Rule formula says that 600 divided by the focal length of the lens (in millimeters) equals the maximum allowable exposure time in seconds. Example: a camera using a 24mm wide angle lens should use a maximum exposure time of 25 seconds (600 / 24 = 25). 8"x10" prints look great using the 600 Rule, but not at 24"x30"
Going from 600 to 450: This old rule or formula is based on the image quality of a typical 8" x 10" enlargement. 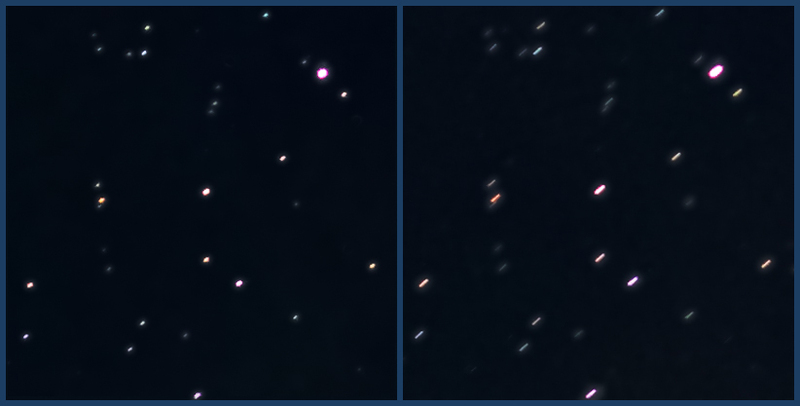 When images are enlarge to 16" x 20" and larger, more star movement or trailing is apparent, so I've adjusted the rule or formula to a base number of 450 in order to increase the image quality. The same camera using a 24mm wide angle lens should now use a maximum exposure time of 19 seconds (450 / 24 = 18.75). *Although the Canon APS-C sensor is slightly smaller than the Nikon APS-C sensor (1.6X factor vs. 1.5X factor), I did not feel the difference is significant enough to warrant a 5th column. Notes: If your ISO is already to the limits, use the 600 column times, or go even a little longer if you have too (ugly noise is worse than having elongated stars). For the least star movement and highest enlargements, use the 450 column. Choose the shutter speed time that best fits your camera. For instance, if you're using a 24mm lens on a full-frame sensor camera, the 450 column says to exposure for 19 seconds. 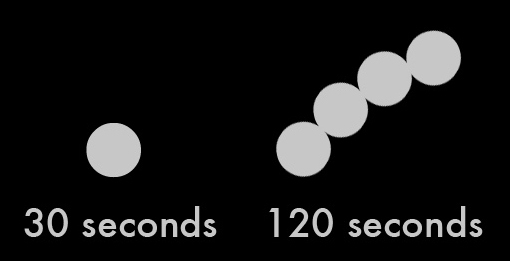 However, the closest setting on you shutter speed dial is 20 seconds. And, if you want even better enlargement quality (and your ISO isn't already max-ed out beyond your tastes), go one shutter speed setting lower to 15 seconds—you'll be surprised at the star movement difference, and the improvement in quality. Use some practical sense, too. For instance, many 15mm wide angle lenses made for a full-frame camera are "fisheye" lenses, with a view angle of 180º. Many 14mm wide angle lenses, made for a full-frame camera, have a view angle of 114º, making their view narrower than a 15mm! The 450 column recommends a maximum exposure time of 32 seconds for the 14mm, whereas the 15mm recommendation is 30 seconds. In reality, because the 14mm has a narrower field of view, an exposure time of 20 to 25 seconds will give much better results. Normal and telephoto lenses: As you approach the normal and medium telephoto focal lengths, star movement becomes even more apparent. Although the 450 column says I can get by with a 9 second exposure (10 seconds on your shutter speed dial), the sharpness of the stars and planets in the photo below was greatly improved by going to only 5 seconds. This is so helpful; thank you! And I love both photos. Each has a unique flavor very appealing to me. I see a lot of you're (beautiful) pictures on 30 seconds. Why is that? if 15 seconds prevents many star stripes trailing? Thanks! I just tried to take star pictures with my 200mm lens and was surprised to see long star trails. But then, I remembered that a telephoto would make a difference. Many of the standard articles presume the use of a wide lens,, so it was nice to find the confirmation and a rule of thumb to use. Much easier than trying to figure out the degrees of movement of the stars & then calculating the effect of different length telephotos! Ultimately the sensor geometry (size and maximum pixels) dictates what "rule of thumb" to use. Using a 1.6 crop sensor and making an image the same size as a full frame sensor will result in a streak that is 1.6 times as long from the cropped camera. 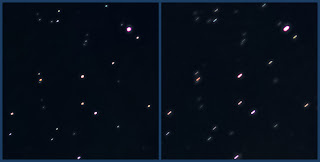 A 5D Mark II at 16mm results in stars that "streak" after 5.3 seconds as can be observed by "pixel peeping". After 28 seconds, that star streak will be about 5 pixels long on the 5D II at 16mm. On the Nikon D800 - also a full frame camera - using a 16mm lens shows streaks that begin after 4.2 seconds. 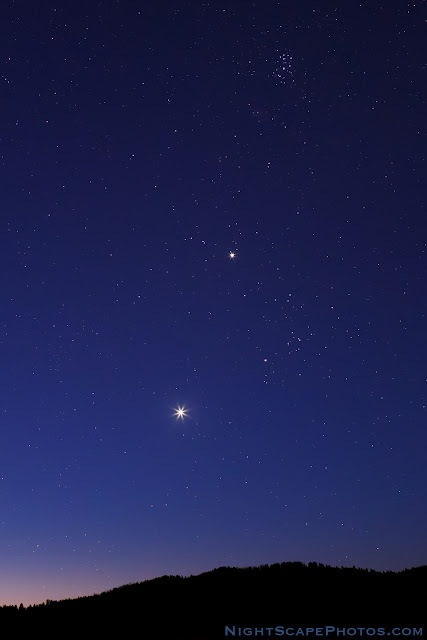 On the D800 that same 28 second exposure will result in a 6.6 pixel streak of the star. The calculations above are "worst case" - a star at the celestial equator, but wide angle lenses typically include this area of the sky. The famous "600 rule" is quite out of date, now, people are amending it by reducing this number to 500, 450 or even 185... It is because it misses many of the fundamentals of the optic. If you don't know the pixel size of your sensor, just divide the width in mm of your sensor by the number of pixels across, and multiply the result by 1000. An APS-C sensor is about 22.2 mm wide, a full frame is about 26 mm wide. This formula is based on declination of 60°. - 13 s for the "simple NPF rule"
- 6 s for the "complete NPF rule"
The assumption that this "Rule" applies equally at all latitudes does not seems right. Surely, an object at the equator travels further in the same amount of time than one halfway to the poles and surely this should affect things shouldn't it? Yes, a star traveling on the equator moves faster than a star close to the celestial pole. As I already said, the "simple rule" assumes the stars are at 60° declination. This covers most cases. Should you need more precise value, use the "complete rule" (but more complex). The simple NPF rule gives anyway better results than the 600/F rule (or any other number i/o 600) for any setup. I managed to program the complete NPF rule for online calculation. You just need to choose your DSLR or digital back among a list of 340 references (Canon, Nikon, Hasselblad, even Phase One...), the height above horizon and direction of the center of the photo, its orientation (landscape, portrait) and the setting of your lens (focal length, aperture). Night photography is one of my favorite area. Thanks for the tips. There is a good article about Low Light Photography. I think this will help the readers. Rule of Thirds Hope you will find it useful.